Moussaka is a popular casserole in the Mediterranean and is usually made out of layered vegetables, meat and sauce baked until tender. There are also versions where a béchamel like cheese topping is added giving a richer and creamier flavour. This dish is one of the most popular Greek food and it was believed to have originated from the Arabs who originally brought eggplants to the region during the Middle Ages. Now on the other hand the Arabs especially in Lebanon thinks the dish is of Greek origin which contradicts the first belief. Now to complicate that this dish is also found and popular in Turkey. Until now the origin of this dish is not yet clear as there was no written account on its creation but one food historian proposes that it originated from a dish called the Levantine musakhkhan. It was said that the moussaka we know now is nearly similar to the recipe of a thirteenth century Arabic cookbook known as the Baghdad cookery book where vegetables and meat with spices are layered then cooked in a flame. For me I don’t care where it came, we were just lucky this was invented as it is very delicious. The combination of flavours is just fantastic, think of it as a vegetarian lasagne, it’s rich, creamy and definitely yummy! Sprinkle eggplant with salt then set it aside for 30 minutes to draw excess water. Rinse with running water then pat dry with paper towels. In a large heavy pan add oil then cook eggplant, zucchini and potatoes until brown on each side. Eggplants and zucchini will take 3 minutes on each side while potatoes will take 4-5 minutes on each side. Remove cooked vegetables and place on a paper towel lined plate to drain excess oil. Using the same pan sauté garlic and onions until soft. Add the red wine vinegar, chopped tomatoes, lentils, vegetable stock, oregano, parsley and sugar. Bring to a boil then simmer for 15 minutes or until sauce is rich and thick. In a 13 x 9 inch baking dish layer ⅓ of the eggplant, ⅓ of the zucchini, ½ of the potatoes, pour ⅓ of the tomato mixture then ½ of the feta. Repeat the process two more times, there is no more feta on last layer. Place in a 190C preheated oven and bake covered for 25 minutes. In a saucepan add and melt butter then sprinkle in the flour. Cook until it forms a roux then gently add milk while continuously whisking. Continuously until sauce is thick and smooth then season with pepper and nutmeg. Remove from heat, let it cool then stir beaten egg yolks. Pour sauce over moussaka then top it with parmesan cheese. Place back into the oven uncovered and bake for 30 more minutes until top turns golden brown and bubbly. 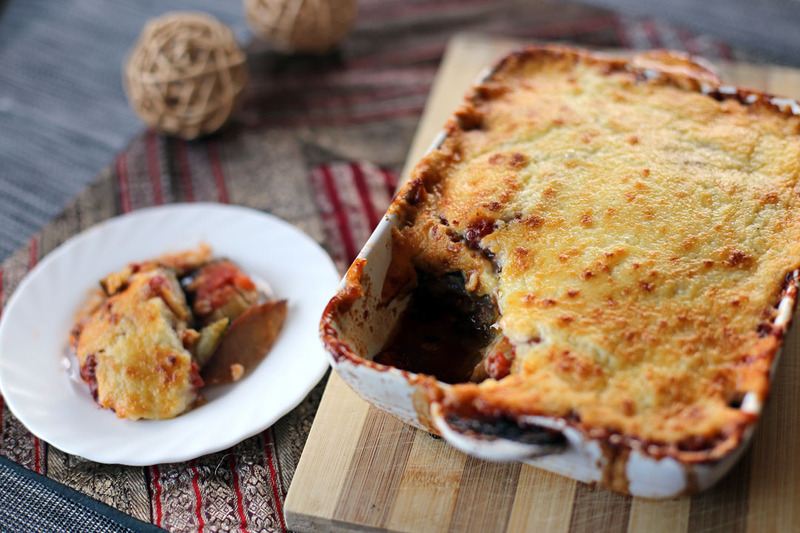 The moussaka sound delicious as I love vegetables cooked in a casserole like this. I’ve eaten this in restaurants but I’ve never made it at home. It’s just the two of us and I always make too much. I’m going to halve your recipe and give this a go. I love this stuff. Oh, yes Raymund – great use of upcoming summer veg. Heard of this, never tried. Think they say it’s Greek. My girl would love it for sure, she loves egg plant. Lovely pics – love your table setting background. 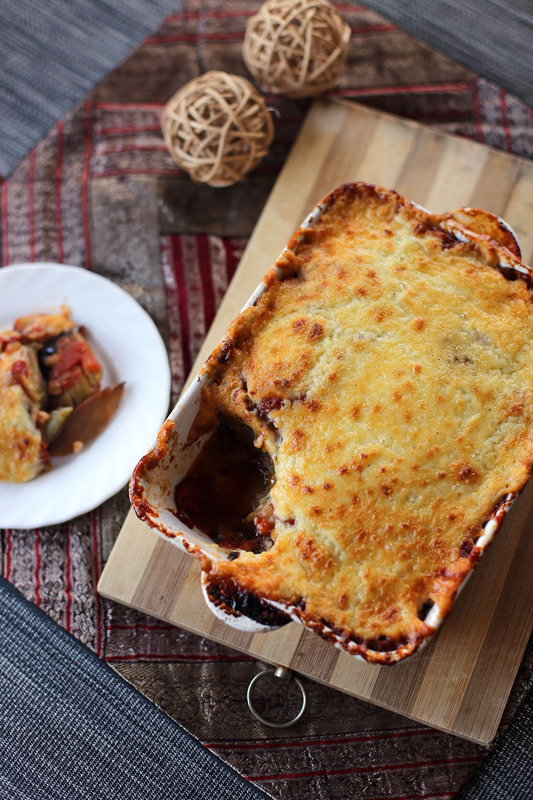 Moussaka is a great dish although I have never had its vegetarian version. This looks amazing, Raymund! This is one of my favorite dishes when we go out for Greek food. I’ve never made it at home though. This looks delicious! Hi Raymund, I just found your blog. Everything looks delicious. I’m making my menu for the week using your recipes! I am having some problems printing out the recipes. How do I make the print-ready format come out? When I first tried to print this recipe, the printer icon didn’t show. I clicked on “other -> print” and the recipe took up many, many pages because of the ads. The recipes with print button will work but the old one will not not, am in the process of converting the old recipes. And thanks for visiting.